Growth Habit: An erect plant which grows up to 1.2m in height, averaging 0.6 to 0.9m. The plant tends to be woody near the base. Leaves are a paler green on the underside and have visible oil glands. Type of Plant: St Johns Wort is a perennial, which usually dies down over winter and re-emerges from underground stems in spring. Flowers: The five petalled yellow flowers grow in clusters. Each flower is approximately 15 to 25mm in diameter and appears to have black dots that are actually glands. Fruit/Seed: Seeds are released in late summer. Dispersal: Reproducing from underground stems and seeds. 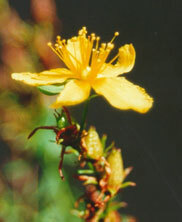 Distribution: Several small infestations of St Johns Wort occur throughout Tasmania. These are usually roadsides and run down grazing land. Status: Secondary and Prohibited in Tasmania. St Johns Wort contains substances known to cause illness in livestock, such as photosensitisation of unpigmented parts of the animals skin. It is also a valued medicinal plant by some herbalists. It is capable of infesting large areas of grazing land, particularly in drier climates. Grubbing. Isolated plants and small infestations can be removed using hand tools, ensuring the root system is also removed. Herbicides. Spot spray for smaller patches and boom spray for larger areas. Herbicides registered in Tasmania include 2,4-D, triclopyr and glyphosate.